The Icarus black rust proof 2.5w LED down wall spotlight is IP44 rated, double insulated and both vandal and corrosion resistant. It is supplied complete with a replaceable GU10 LED lamp. Please note that a halogen GU10 lamp must not be used in this fitting. 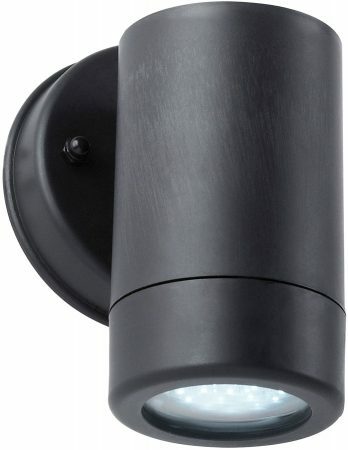 Finished in black, with circular wall mount and short vertical cylinder containing an LED lamp in the bottom to shine the light down the wall and onto the ground below.